This photo was taken of the Indianapolis skyline at night from the new JW Marriott Hotel and I was lucky enough to actually capture a shooting star in this photo! If you click on the photo it will enlarge in a new browser window, so be sure to check out the shooting star in the upper right corner! Rose and I were sitting in our hotel room looking out the window and playing with the settings on my camera and I started taking some photos. It didn’t take long, but about 10 minutes into taking the photos, I took a photo and both of us thought that we saw something in the sky and sure enough after looking at the photo, I had caught a shooting star…BY ACCIDENT! I had always wanted to take my camera out in a dark field to take photos of shooting stars, but to date haven’t done it yet. I’ve taken a few photos of stars, but when shooting stars, you can’t have the shutter open very long because believe it or not, stars move. If the shutter is open too long, you will see the stars spiral around, which is also a very cool photo! For this photo, the shutter was only open for 0.8 seconds. 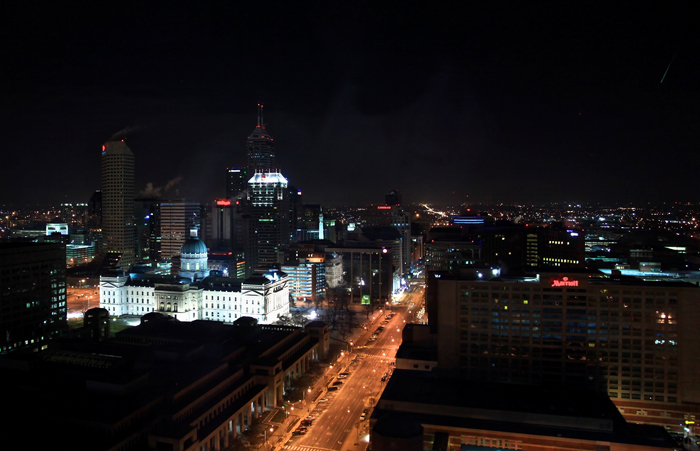 I took this photo in January 2012, less than one month before the 2012 Super Bowl XLVI 46 game, which took place just a couple blocks south of the JW Marriott Hotel at Lucas Oil Stadium.